Africa needs to redesign its cities in a way that will create jobs for its growing youth population, Economic Commission for Africa (ECA) Executive Secretary, Vera Songwe, said Friday. 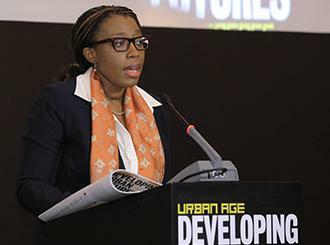 Speaking at a two-day Urban Age Conference on Developing Urban Futures, Ms. Songwe said Africa should work hard to make its cities engines of growth that in turn will generate employment for the youth and ensure there’s equitable growth on the continent thus ensuring no-one is left behind as enunciated in the UN 2030 Agenda for Sustainable Development. “Developing Urban Futures allows us an opportunity to consider how we redesign our Cities to create the economic growth we need to create jobs for our youth,” said Ms. Songwe. She gave an example of how authorities in Seoul used green stimulus following the 2008 financial downturn to finance the redesigning of the City to what it is today. The ECA Chief said growth was being recorded in many Cities across the continent but added more needed to be done to ensure the growth was inclusive. “As part of the new economic policies we are putting in place as a continent, we can look at different elements of the growth story to see where exactly it is happening and to ensure that no one is left behind,” Ms. Songwe said. Partnerships, she said, were crucial for ‘this huge agenda of redesigning our Cities’ that lies ahead. British Ambassador to Addis Ababa, Sussana Moorehead, also spoke about the importance of partnerships in building Cities. She said London had a lot to share with Africa, including its successes and mistakes, as the continent moves to improve amenities in its Cities and deal with urban development issues, in particular productivity, growth, innovation and financing. “When we look at Africa, its Cities are growing at a phenomenally fast rate but some people continue to live in appalling conditions; there’s jarring poverty, no electricity and no running water in some areas but these challenges can be turned into opportunities. Partnerships are key and sharing knowledge as well,” she said. The Urban Age “Developing Urban Futures” conference, jointly organized by LSE Cities at the London School of Economics and the Alfred Herrhausen Gesellschaft, focused on the development of Cities in rapidly urbanizing countries. By convening urban experts, policymakers and practitioners from Africa and other world cities, the conference raised questions about the economic foundations of urban change and investigated how current models of planning and governance succeed or fail to achieve greater integration between efficiency, accessibility and social justice. This was the seventeenth Urban Age conference organized since 2005. Posted by Geraldine Boechat on December 1, 2018. Filed under News, Zoom. You can follow any responses to this entry through the RSS 2.0. Both comments and pings are currently closed.